The beaches in Vietnam are so beautiful, and they’ve long been hidden under a shroud of secrecy. Luckily, this is no longer the case, and the breathtaking coastline is waiting to be discovered. 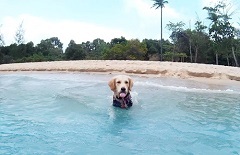 If you are planning to travel with your dog to Vietnam, then you need to check out these pet friendly, white, sandy beaches and crystal clear waters. With the tropical climate and all that space for running, you and your dog will have a great time. Here are five Vietnam beaches where dogs are welcome so that you don’t miss any of these beautiful places. If you decide one of these beaches is for you, be aware that all of them come with specific regulations which must be respected. After all, you don’t want to end up paying a fine on your vacation. The Nha Trang beach is located around a beach resort city and has a six-kilometer stretch of pure bliss. Because of this, you can enjoy the sightseeing while your dog soaks his paws in the powdery sand. Honestly, this is the most beautiful bay in all of Vietnam, and the beach serves as the connection to numerous islands. However, you should be very careful about going in the water if you aren’t a seasoned swimmer since it’s very deep. Overall, dogs love the Nha Trang beach and atmosphere it embodies. However, since it’s a very busy beach, your dog will need to wear a muzzle and be leashed at all times. Ly Son is an island situated 2 hours from the mainland, and it offers peace and quiet with untouched nature. However, if you or your pooch suffer from sea sickness, taking a pill before the ferry ride is a must. Besides the beaches, you can take your dog for a hike or rent a bike and explore the serene surroundings. Additionally, the Thoi Loi Peak offers a magnificent view of crystal blue sea and coral ridges. 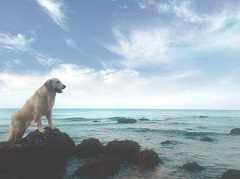 Lastly, your dog will appreciate no specific rules and enjoy getting into the sea without a leash or a muzzle. Plus, the parking is free. Phu Quoc is the largest island situated in southern Vietnam, and it’s famous for a dog breed called Phu Quoc Ridgeback. This breed has a ridge hair that grows in the opposite direction of the rest of its coat, and it is a fun thing to see. Your dog will love exploring the national forest, and the yellow sandy beaches without any restraints. But, you will have to pay some attention while in or close to the water as the island experiences some problems with trash. Still, the water is lovely, the sand is soft, and the topography of the island gives you an opportunity for endless hikes and activities. During these hikes, your dog will love sniffing around, and when they get tired, there is no shortage of places to lie down. Since the My Khe beach is very long and wide, it offers plenty of opportunities for a relaxing day with your dog. 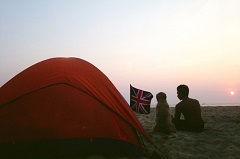 The beach is open 24/7, and there’s no shortage of space if you want to watch the sunset with your pooch. Once you are rested and relaxed, you can take your pup for a run near the water line with the muzzle on. If a muzzle stresses your dog, you can opt for a leash. Additionally, this beach offers amenities like showers which is a great thing for when you have a pooch that is covered in sand. Plus, parking is also available, and it only costs .01$. The Mui Ne beach is a long stretch of sand that was once deserted and is now becoming full of beach resorts. However, it’s still unfamiliar to tourists and can be a great getaway for people and pooches alike. If you want to relax and spend time with your dog, this pet friendly beach is great because it isn’t a very urban place. 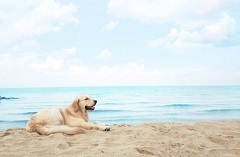 In fact, pooches can be taken to the beach without a leash and are allowed to explore everything in sight. More importantly, the nature around this beach is lovely and gives you a chance to take a hike or check volcanic waterfalls. Also, the parking is free. However, make sure to bring water since there’s a shortage of fountains. No matter where you travel with your dog, we advise that you bring his favorite dog food with you. Some dogs experience intestinal upset from the local cuisine, so bringing your own will ensure a happy vacation for everyone. These five beaches don’t have strict dog policies, and it would be a shame not to visit them while you’re in Vietnam. When present, rules and regulations are there to ensure the safety of your dog and other travelers, so do your best to follow them. Find pet passport information for transporting your dog to Vietnam. Veronika – the best way to travel depends on where you are and where you want to travel to with your pet. Ground travel is preferred if possible, but not possible over water. Very few options over water but flying and the Queen Mary 2. I see pictures of the same dog. How did you get to all these places? 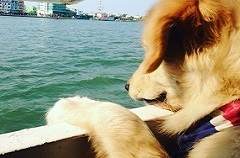 We are based in HCMC and we would love to travel with our dog but having difficulty to find the best way to do it. Train, private car, air plane? To access Northern Vietnam, it is done through Hanoi. To access Southern Vietnam, it is done at Ho Chi Minh City. We are not aware that live animals can enter Vietnam at Da Nang. The process is relatively easy and should take no more than 1 hour. Can i enter Da Nang directly with my dog by the international flight? What do I have to go through at the airport?